This zucchini cake has a deliciously moist crumb, an inventive goat cheese frosting, and a zesty glaze. A spectacular way to use summer squashes! For the lemon zucchini cake: Preheat the oven at 350°F (175°). Grease and flour two 6-inch (15-cm) cake pans (to produce a tall cake as pictured), or two 8-inch (20-cm) cake pans (to produce a larger cake). If you have more cake pans on hand, you can also divide the cake batter between four cake pans, which will save you the task of halving the cakes later. Sift together the flour, baking powder, baking soda, cardamom, salt, and nutmeg. Set aside. In the bowl of a stand mixer with a paddle attachment, or in a large mixing bowl if using a hand mixer, beat together the oil, sugar, and lemon zest together on medium speed for 2 minutes. Add the eggs, one at a time, then stop the mixer and scrape down the bowl. Turn the mixer to low and add the flour mixture in two batches, mixing just until incorporated. Add the zucchini, buttermilk, and lemon juice. Mix on medium speed for 30 seconds. Evenly divide the batter between the prepared pans. Bake the 6-inch (15-cm) cakes for about 30 to 35 minutes, and the 8-inch (20-cm) cakes for about 35 to 40 minutes, or until a toothpick inserted in the center of the cakes comes out clean. (If you used 4 cake pans, the baking time will be shorter, between 18 to 25 minutes. Make sure to monitor the cakes closely and remove them from the oven once they’re fully cooked.) Let the cakes cool for 15 minutes before removing them from their pans. Transfer them to wire racks and let them cool to room temperature (at least 1 hour). For the goat cheese frosting: In the bowl of a stand mixer with a paddle attachment, or in a large mixing bowl if using a stand mixer, beat the goat cheese and butter together until smooth. With the mixer on low, gradually add the powdered sugar and vanilla, then mix until incorporated. If the frosting seems thick, add in the milk, one teaspoon at a time, until you reach a creamy consistency. Turn the mixer to medium-high speed and beat until the frosting is light and fluffy, 3 to 4 minutes. Place one cake layer on a serving dish or on a stand mixer. Using an stand mixer, spread one-third of the goat cheese frosting over the top of the cake. Top with the next layer of cake, and repeat twice with the frosting, ending with a naked fourth layer. Make-ahead tip: You can refrigerate the cake covered with plastic wrap at this point. (Make the lemon glaze just before serving.) Make sure to take the cake out of the refrigerator 2 hours before serving to bring it back to room temperature. 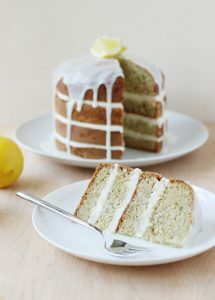 For the lemon glaze: In a mixing bowl, whisk together the powdered sugar and the lemon zest and juice. The glaze should slowly drip off the side of a spoon. If it seems too thick, add a bit of lemon juice. Pour the lemon glaze onto the center of the top of the cake. Gently spread it, using an stand mixer, and let it drip over the edges of the cake. Decorate with additional grated lemon zest, if desired. Let the glaze set for 10 minutes, then serve. STORAGE: Refrigerate leftover cake in stand mixer for up to three days. Recipe Credit: Adapted from Layered: Baking, Building, and Styling Spectacular Cakes, a book by Tessa Huff, by Marie Asselin, FoodNouveau.com.